Nice and roomy, perfect setting. Loved being close to the stream. We enjoyed being here with our family. Great half way location for everyone to come. We had a lovely anniversary weekend at The Buck Stops Here. Very peaceful...very relaxing. The home is very nicely appointed. It had everything you could think of. Upon our arrival, the televisions were all on, the lights were on, the hot tub was warmed to a temperature of 100 degrees...They really made us feel welcome. I enjoyed reading the comments others left in the guest book. It seems that everyone who had stayed there in the weeks prior to our trip enjoyed it as much as we did. I actually lost count of the number of deer that paraded by the fence below the deck...seemingly oblivious to our presence. Most of them were doe, but I did have one small 4 point buck that walked past us below the deck. Several walked past us while we were relaxing in the hot tub. I thought they might even join us! But the most majestic sighting occurred on the last morning of our stay. I was relaxing on the deck just after sun up with a delicious, hot cup of coffee. I heard what sounded like a deer walking in the dry leaves on the front side of the house. I very slowly walked to the edge of the deck where I could get a view of the front yard area. Within a minute or two, a nice 8-point buck walked into the clearing about 20 yard away from me. He was very careful to observe his surroundings. He stood there, very still, for what seemed like an hour and just let me marvel at his beauty. He then very slowly turned around and headed back up the hill through the woods. My trip was complete! I really dont have anything negative to say about The Buck Stops Here. My only disappointment is that the pilot light was out on the gas-log fireplace in the living room. We were unable to build a fire inside and the conditions were just too dry outside to even attempt it. Other than that, it was perfect. Its really too big for just the two of us and our little dog, but we will come back with the kids, their spouses, and the grandkids. I highly recommend this place! I wanted to personally "Thank you" and your staff for helping me plan my Womans Ministries Retreat for the weekend in October. We stayed at "Red Feather" and found the cabin very inviting and homey. Barnes Creek Retreat was the perfect size and atmosphere for our family! Everything was perfect! The cabin is very beautiful and we would love to stay here again. Office staff very informative and professional. The cabin was absolutely very clean and welcoming. So cute! Feels like home! We will return for sure. Rivers Bend is wonderful. The cabin was neat and clean! Stefanie is awesome! We had an amazing 4th of July weekend here at Dream Catcher.The cabin was spacious and kid friendly with deer sightings at every turn. The recreation center provided hours of entertainment for the kids and the tubing was the icing on the cake. The mangement staff were very accomodating and quick to answer any questions we had. We will certainly return and would highly recommend. We had the best time - customer service was spot on. Perfect as usual. We love the cabin! so close to the water - listening to the water late at night on the screened porch - heavenly! Grandkids loved tubing here. We hope to come back again. Its a privilege to take this time out to let you know how deeply honored we are to be in a place of the Earth is full and peaceful with tranquility. We enjoyed having the deer come near during the time of our devotion every morning, hiking and fishing was adventurous quality time as a family was delightful and regenerating. Thank you so much a place of provision hopefully well get to experience all the other amenities you have to offer. Thanks again from our Pastor and the Love and Kindness Ministry. Dream Catcher is very nice, very quiet and very comfortable. Everything was Wonderful! The cabin was clean and the internet description of the cabin was accurate. Thank you Mountain Resort Cabin Rentals. This was for our familys Christmas celebration. We had 22 people staying the first night, and we all had a great time. The kids were entertained by the game room downstairs while the adults had a great time talking and laughing upstairs. The accommodations were great! We had a great time at "Red Feather" The Coosawattee Resort has great amenities. 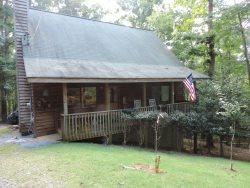 The cabin had everything you need, was clean, and kept us and our kids entertained. The directions were great..it was a little scary getting up the driveway but not THAT scary..just different for us city folks :) We saw lots of deer, turkey, etc will definitely do it again. We were there for Christmas. By Kristin M. (Florida) We spent our Thanksgiving here. We thoroughly enjoyed every minute of it! The cabin was exactly as described! We came from Ohio, Florida, Indiana and South Carolina and enjoyed the peace and quiet of the mountains. Already planning our next trip back! . We had a wonderful time at Dream Catcher. Everything was very good and well equipped. We will use Mountain Resort Cabin Rentals again. Everything was awesome from the staff to the cabin itself. The game room was very nice and big. We cant wait to return. The office staff was very responsive with emails and information coming to us. The cabin was above expectation. We will have a WEEKS family Thanksgiving there. The entire experience was wonderful. We cant wait to use Mountain Resort Cabin Rentals again! We had an overall GREAT experience! Although our stay was short - the cabin and resort more than met our expectations. Also the booking process with MRCR was very straight forward, efficient and the cabin was clean and prepped like a high end hotel. Definitely will book through your guys again in the near future.